Let's just call him Officer Funky Beatsman. The Notting Hill Carnival 2011 has come and gone, and apparently most of the folks who went had a good time. That’s not just the people outside the barricade, but even one of the security staff on hand was having fun, and now he’s the star of a brand new viral video. Carnivals have many attractions, that’s true, but this one wasn’t scheduled. 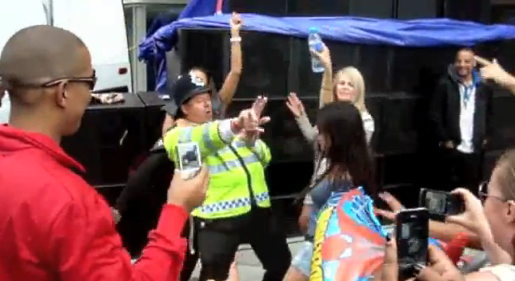 A video of a London Met Police officer dancing to house music has become an online hit. The dancing took place at the SSP Soundstage in Kensal Rise, as part of the 2011 Notting Hill Carnival. The officer, who has not been identified, was working security when the “funky and soulful house, UK garage and classics” set spoke to him. Despite all the cameras, and despite his goofy hat and big yellow vest, the nameless officer let his feet do the talking. He even danced with festival-goers who came over to join in on the spectacle. In the words of the MC of the event, “big up the police inside the place!” You can do your job and still have a little fun, too. In a place like London, so recently racked with violence, this video of a dancing cop will do more for community relations than millions of pounds in PR advertising.